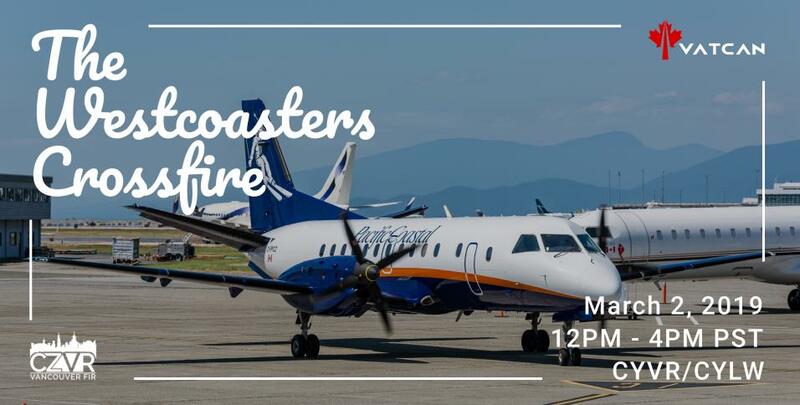 The Vancouver FIR is proud to present The Westcoasters Crossfire! Come join us as we fly across the beautiful province of British Columbia between the Vancouver and Kelowna airports. Vancouver and Kelowna will be fully staffed top to bottom for this amazing event. This will be a two-way crossfire event, all traffic is welcome VFR or IFR. So come on out with your favorite flying machine and join us for an afternoon of fun! Controllers, please reply below if you would like to sign-up for any shifts. First come first serve! Last edited by Anson Tam on 02 Mar 2019, 07:10, edited 13 times in total. Also, shoutout to Charlie for helping us make the banner! I'll put you on CYLW_TWR for now. I may move you to CTR depending on the controller turnout or if we decide to CTR split for traffic. Please sign me up. Any position will do. Thanks Brad, I will put you in where needed once more controllers signup. I will put you on CYVR_GND for now. Thanks Joshua.